There is Gordon Biersch -- not a single person named Gordon Biersch -- but rather Dan Gordon and Dean Biersch, two guys who started making beer in Palo Alto, California in 1988. Their first brewery restaurant is still located on Emerson Street in downtown Palo Alto, a couple of blocks off of University Avenue which runs into Stanford University. Gordon was a hot-shot brewer at the time, being one of the few Americans to graduate from the five-year brewing engineering program at Germany's Weihenstephan, a Benedictine Abbey brewery founded in 725 A.D. that also serves as a campus of the Technology University of Munich (TUM). Dean Biersch came to the party of two as a restauranteur and beer lover and together with Gordon started up their first brewery-restaurant venture. Either by luck or design, the location in the college town of Palo Alto and smack in the middle of the high-flying Silicon Valley, made Gordon Biersch a magnetic watering hole for both students and engineers. If you weren't aware of the fact, both types like to drink beer. In Gordon Biersch's case, they liked to drink lots of it. Soon after opening in Palo Alto, the brewery-restaurant began to expand opening their second Gordon Biersch in the historic Hills Brothers Coffee building in the shadow of San Francisco's Bay Bridge. Today, there are 17 brewery-restaurants scattered around the United States. The San Francisco Gordon Biersch lies on the City's waterfront Embarcadero on the corner of Harrison. The brewery-restaurant is easy to spot with its grain silo prominently displayed in the front; it's the only one on the Embarcadero, and tough to miss. There's plenty of parking in the area and Muni will drop you off right in front as well. San Francisco is a great place to walk and there is nothing better than to take a long stroll down the Embarcadero from Fisherman's Wharf towards the Bay Bridge on a sunny afternoon and end up at Gordon Biersch. There you can sit out on the patio in front, watch the rollerbladers scoot down the sidewalk, eye Treasure Island with its Art Deco exhibit hall in the background, sailboats on the Bay, and rest with a cool Märzen beer. Tough to beat. There is one thing that sets Gordon Biersch apart from most brew-pubs in the United States; they don't make ales but rather lager beer according to German's strict Reinheitsgebot. This is the 500-year old German Purity Law that governs the ingredients used to make beer. Originally there were three qualified ingredients, barley, hops and water. This was later amended to include yeast which they figured out was important in the brewing process. They didn't add it to the beer, yeast materialized out of thin air. Dan Gordon's brewing training was in Germany so it's easy to understand why he makes his beer the German way. So how is Gordon Biersch beer different than ale? In a nutshell, ales are top fermenting and are ready to drink after storing for a couple of weeks. On the other hand GB's lagers are bottom fermenting and require a solid four to six weeks before the keg is ready to be tapped. Ales tend to be fruitier and complex and flatter while lagers will be crisper and smoother. Not that there's anything wrong with ales, but making lagers the GB way is more complicated and time-consuming. Whatever, the result is award-winning beers brewed on-site at each of their brewery-restaurants, at many fine drinking establishments (including San Francisco's Monster Park where the SF 49ers play), and are also distributed throughout California, Hawaii, Nevada, Arizona, Washington and Ohio. The following are GB's regular beers available at their brewery-restaurants and also sold in distribution. All beers are brewed on-site. This is a golden lager that is medium-hopped, rich, malty, and with a creamy texture. This is GB's most popular brew. It's auburn in color and less hoppy than the Blonde Bock. Märzen is similar to the German Festbier that is served during Oktoberfest. This is crisp, golden, and highly-hopped lager brewed in the Czech style. And no, it's nowhere near a Bud Light. This is a black beer that is smooth bodied with a roasted finish. These are a sampling of GB beers that change seasonally. A Bavarian standard, unfiltered and cloudy, Hefeweizen is brewed with malted wheat and malted barley and is naturally carbonated. This is a summertime beer that is available in the brewery-restaurant in July. It's a regular beer at San Francisco. This is a medium-bodied beer made in the Einbecker style of central Germany. It's a springtime beer to look for in May every year. You guessed it, a medium-hopped bronze lager for Oktoberfest in the Fall. Put on your lederhosen and dance like a chicken. This is double bock that is dark, bitter, and meaty. Just the thing to get you through a long winter night. It's also pretty strong with 7.5% alcohol. Look for it between October and February. This is a dark lager that is smooth and served unfiltered. It's not available at all Gordon Biersch. 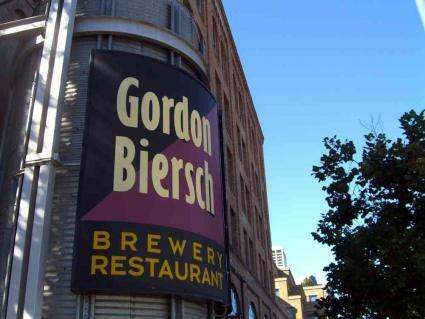 You can add Gordon Biersch to your list of San Francisco restaurants. The menu is filled with the usual brewpub fare including finger-food appetizers, salads, burgers, sandwiches, pizza, pastas, and various fish, chicken, and meat main dishes with Californian-style touches. This is not haute cuisine with a pretension to earn a fork. But there is inspiration behind many of the dishes that use top quality ingredients. You should be able to find something that appeals to various appetites. The following are some tried-and-true menu items. Either GB made garlic fries famous or vice-versa. Good finger food to share. The Wedge Salad, Ahi Salad, and Hummus and Goat Cheese Salad go well with beer, then again, what doesn't. There are several good pizza choices and the Cajun Pasta has a little kick to it. The GB burger isn't to-die-for, but it's pretty good and comes with garlic fries or cole slaw. On the downside I note that they don't have any Schweinshaxn on the menu. Pity. Not quite the full Bavarian experience and an Oom Pa band wouldn't hurt either. That's the motto for Gordon Biersch and it represents their corporate mission to focus on the customer. This is demonstrated on their food that is made from scratch and from fresh, quality ingredients, their service, and their premium beers. Keep in mind that they use double-malted barley, Hallertauer hops, and yeast from Weihenstephan in their brew. And remember, they follow beer law to the "T". Brewpubs are not for everyone. 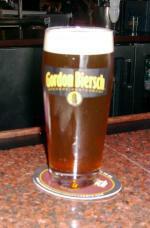 Gordon Biersch tries hard to make beer:food a fifty-fifty proposition. But the truth is it's the beer and the location that bring people to GB on the corner of Embarcadero and Harrison. The food and service are generally good and a notch above most brewery-restaurants. There are some complaints that the beer is higher in price than at most brewpubs but again, most serve ales that require less effort to make. If you're a person that appreciates high-quality German-style beer in a lively atmosphere with good food, then Gordon Biersch in San Francisco is a great destination. Obviously there are plenty of people that agree because the place gets crowded and hopping on most nights. There are plenty of tables in the main dining room with more seating upstairs when they get jammed. And don't forget the outside patio dining to watch the world by the Bay coast by.